Vickie Hallmark jewelry design Vickie Hallmark: Cigar Box Jewelry Box Finished? Cigar Box Jewelry Box Finished? 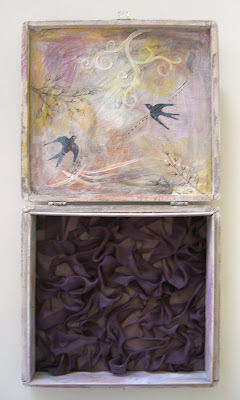 I painted the inside of the cigar box today and added a ruched violet chiffon padded lining. I'm going off to work with glass for the afternoon and ponder whether I'm happy with this finish, or whether I need a few more details. After all, I have more boxes to paint! Note to self: keep working on that "simpler is better" thing.